Located 15 km from Medak and 115 km from Hyderabad, this sanctuary can be reached by private transport from Medak. Pocharam Forest was the favourite hunting ground of the Nizam and he declared it as a wild life sanctuary in the early part of 20th century. Named after the Pocharam lake formed form bunding of the Allair in the year 1916-1922, it is spread over 9.12 Sq. km. Surrounded by lush green forest, it is rich in flora and fauna and attracts a lot of winged visitors, like the Bar-Headed Goose, Brahminy Bucks and Open Billed Stork. 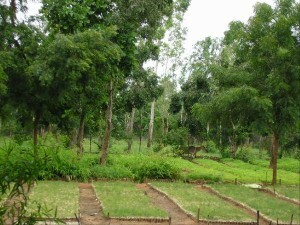 There is a centre for Eco-Tourism where visitors can see five species of Antelopes and Deer, summer temperature goes up to 46° C and in winter it drops to 6° C. The sanctuary is home to animals like Leopard, Forest Cat, Wild Dog, wolf, Jackal, Sloth Bear, Sambar, Nilgai, Chinkra, Chital, and four horned Antelope. Best season to visit is November to January. Air: Nearest airport is Hyderabad. Road: 120 km by road from Hyderabad. This entry was posted in Andhra Pradesh, Pocharam Wildlife Sanctuary. Bookmark the permalink.